It's difficult to beat the combination of cherries and almonds, the flavours work so well together and we love these gorgeous little cherry bakewell parfaits. 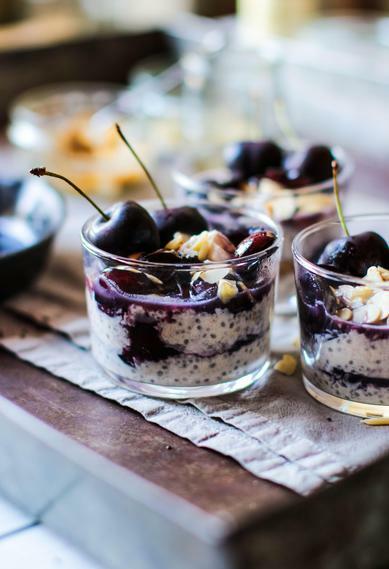 Layers of creamy and almond-y chia and oats, sweet seasonal cherries, vanilla coconut yoghurt and more almond butter for good measure. Combine all the ingredients for the oat and chia layer in a jar. Mix to combine well. Pop it in the fridge overnight or at least 4hrs. Add the pitted cherries, maple syrup and a splash of water to a small frying pan. Cook on a medium heat for a few minutes until the cherries soften a little. Set aside. Stir the maple syrup and vanilla into the coconut yoghurt. To compile: layer the oat/chia mix into two medium or three small pots. Next add some cherries then coconut yoghurt and almond butter. Repeat. Top with flaked almond and more cherries.